For someone who turned 23 in April, Tyler Toffoli already has a cabinet full of awards and accolades. He’s won a Stanley Cup, a World Championship, the Eddie Powers Trophy, the Jim Mahon Trophy and the Red Garrett Memorial Award. While there’s something terrific to be said about being the OHL’s highest scoring right wing or the AHL’s top rookie, he claimed an award in 2015 that affects a wider pool of people than many of those worthy accomplishments. After the season’s final game on April 11, Toffoli was named the recipient of the Jim Fox Community Service award by the Kings Care Foundation. No other player devoted as much time to community or charitable endeavors as Toffoli over the past year. 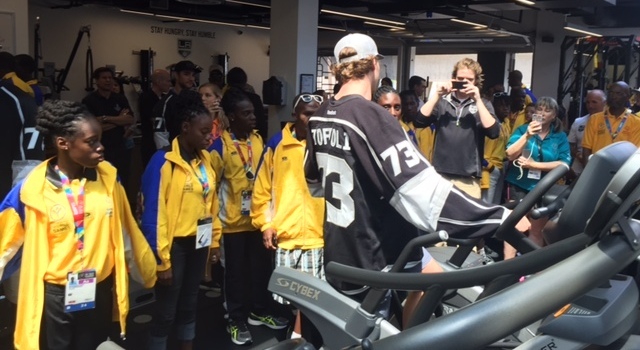 Speaking at the Kings’ El Segundo practice facility on Thursday, Toffoli noted that the club’s outreach was something that he wanted to immerse himself in even as one of the youngest players on the roster. 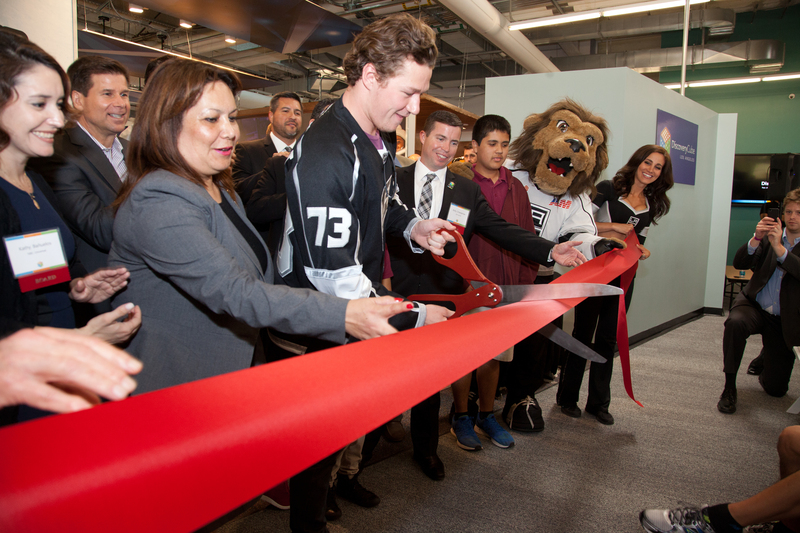 Recently, that has meant opening the Kings’ Science of Hockey exhibit at Discovery Cube LA – on a scheduled recovery day, no less – and appearing at Children’s Hospital Los Angeles, the Kings’ pet adoptions and presiding over the graduation of the latest class of the Lil’ Kings Learn to Play Hockey program, of which he is a presenting figure. He has also helped fundraise for Hydrocephalus Association and will soon take the ice with Kyle Clifford and Matt Greene to run the Kings Youth Hockey Camp in early August. 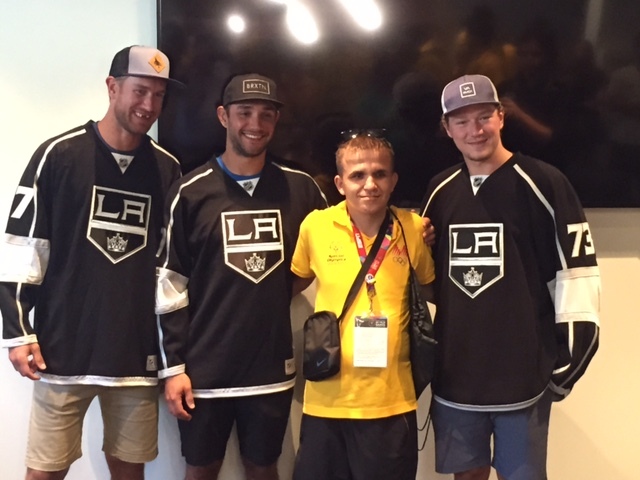 Earlier on Thursday, he joined Jeff Carter and Alec Martinez – both of whom have also associated themselves with community largesse – in leading the Macedonian and Barbadian Special Olympics World Summer Games delegations in a tour through the Kings’ practice facility, and his guidance, much like Carter’s and Martinez’s, came naturally. Tyler Toffoli speaks at the 2015 Lil' Kings graduation! I think my parents like when I do these kinds of things because it just shows how they raised me and they raised me to be nice and to be a gentleman to whoever you’re with. It’s fun doing these little things and to give back as much as I can. And like I said, Jen knows she can ask me to do pretty well anything, and on our off days it’s kind of nice to relax, and I don’t mind getting out and helping out. I think they were excited. I showed them the Arc Trainer there and the curved treadmill. I’m assuming they don’t have this type of technology for them to train [with]. I saw a couple of them running on the curved treadmill and it’s pretty crazy because I wouldn’t get on there myself, to be honest. It’s cool and I think they had fun seeing our gym and how incredible it is. They’re definitely excited.